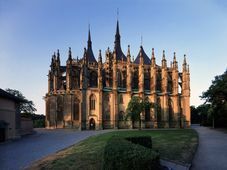 Ossuaries, grim collections of mostly medieval bones, are to be found all over Europe, with one of the most striking examples anywhere being the infamous Sedlec Ossuary in Kutná Hora, sometimes called one of the spookiest places in the world. Only ten years ago though, archaeologists working under the streets of Brno discovered a crypt that would earn a new claim to fame; the largest collection of human bones in the country and the second largest in Europe after the Paris Catacombs. 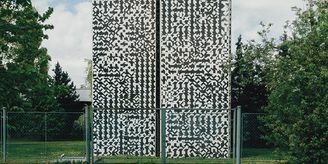 Brno Ossuary, photo: Jiří Vaňáček, Creative Commons 3.0 In 2001 the authorities in Brno ordered archaeological research to be carried out on one of the city’s central squares, Jakubské náměstí, so that structural modifications could be done. The archaeologists knew that digging in the area of the 13th century Church of St James, from which the square takes its name, would yield interesting finds. They also knew that the square had been built over the church’s cemetery some two hundred years before. But what they actually uncovered, they said, exceeded their wildest expectations. Aleš Svoboda is the author of two books mapping the hidden side of the Moravian metropolis and took part in the research. Not only did they find bones, they found bones everywhere they looked. 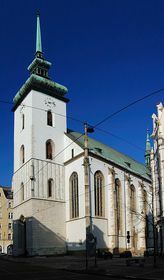 The Church of St James, photo: Petr Šmerkl, Creative Commons 3.0 The largest of them was enormous and was beautifully preserved, lying under where the square is today. 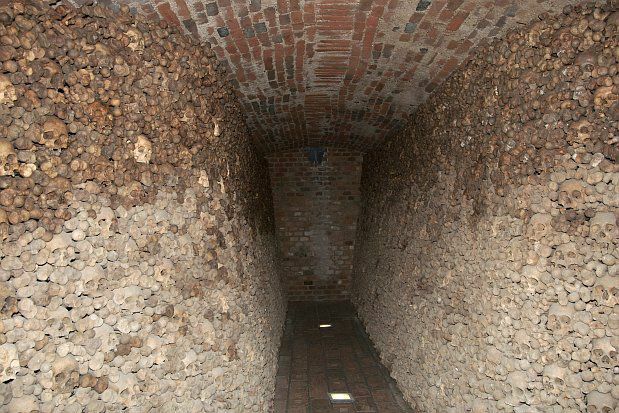 Further research showed that one of the corridors led under the church and connected a large crypt that also served as an ossuary, with three rooms and located directly under the nape of the church and spanning 25 metres. 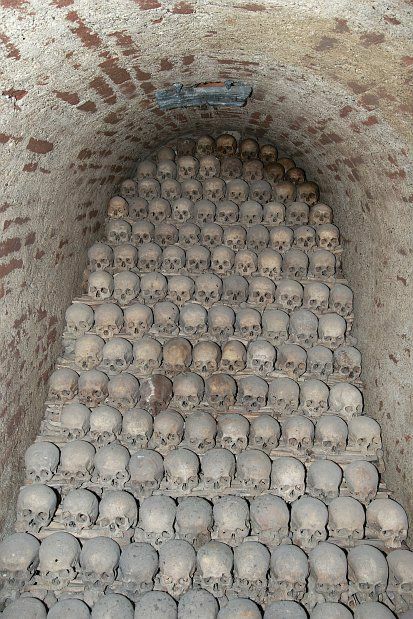 In the three large rooms there were thousands to tens of thousands of human skeletons. The last time the stone had been lifted was before the Second World War, when new tile was being put down in the church. That time a photographer went in and the level of the bones had gone down a bit. He only took two photographs, one of each side of the crypt, but they only showed what his lens could see. The cemetery beneath Jakubské náměstí was in use for more than half a millennia, and the oldest skeletal remains come from the 15th to the 16th century. 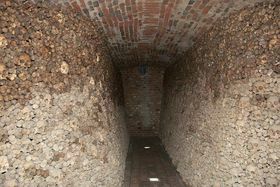 But research into the oldest sections, located directly under the church, is still underway ten years after the initial discovery because of the difficulty of finding funding – which eventually came from the EU – and jurisdictional problems arising from the ossuary lying party under the square, on municipal grounds, and mostly under the church. In any case, everyone can be glad that the find was made when it was. 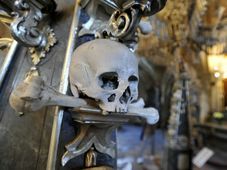 Since the discovery, Mr Svoboda has been working with the authorities to resolve these problems and protect the 800-year-old ossuary. One of the proposed ideas, to pour cement slurry over the bones to reinforce and preserve them, was deemed absolutely unacceptable. So the researchers chose the opposite solution of bringing all of the bones out and storing them in the many cellars in the area, repairing the structure and ensuring the structural integrity of the church, and putting down a new floor with lighting. “For ethical reasons and for the sake of reverence we then began returning the bones. Using the methods of our forbearers we then piled the bones very carefully into configurations. But we did it in such as way as for everything to be well ventilated and not decay." For the time being – which has been a long time now – the ossuary is open only provisionally, with access to specialists and special excursions. The only way to reach the tomb is through ladders in hatches in the pavement. The EU funds are meant to include the construction of an entryway from the square. 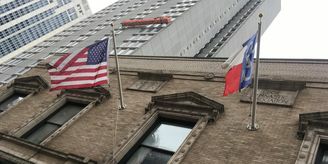 The current plan foresees a public opening at Christmas of 2012. But meanwhile, as work continues, new discoveries are still being made. 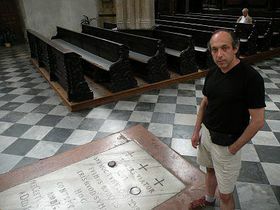 The researchers expect that the graves hold prominent townsmen or clergymen connected to the church. That mystery should be uncovered in the next month as the coffins are cleaned and will be presented to the public during the summer. 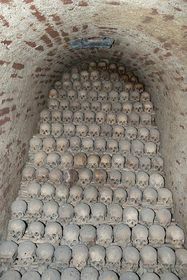 But it will likely be the last mystery that the Brno Ossuary has to offer, as probes have found only normal earth beneath it. For the future, Mr Svoboda envisions a very special place of for homage to the history of the location and the 50,000 souls interred there.